Claire Liebig-Denham’s New Book Reviewed. If you are just starting out in the fascinating hobby of metal detecting or treasure hunting, or even if you have been in it for a while, who do you turn to for advice? Someone who has only recently got their feet wet in the hobby or an old hand who can hardly remember what it was like to be a beginner? Personally I would go for both views and this is the excellent well-researched starter’s view I can thoroughly recommend. I like the way Claire has put this book together, with the main text covering the essentials, in 130 pages, together with many links to videos and web pages leading to more in-depth information. The contents include: eight pages of useful TIPS to get the best out of your detecting. This is a boon for newbies and a refresher for old hands. There are ten pages of RESOURCES with many links to excellent sites related to metal detecting, such as maps, soils, site finding, history, finds identification and dowsing. This section is invaluable, for here I discovered a fantastic website, which led to nearby land where several Roman gold coins had been found. A cache hereabouts is likely and needs investigating. Sixty pages of INFORMATION follow that you can dip into at will. 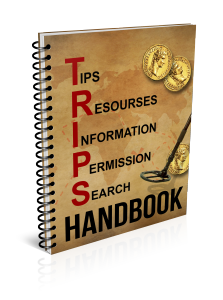 The information is divided into three main sections covering clubs, associations, forums and websites; a comprehensive section on voluntary codes, finds reporting, rules, regulations and laws around the World and finally a glossary of metal detecting terminology essential to beginners. The find of a lifetime starts with getting permission and the PERMISSIONS section gives good coverage of techniques you can use to persuade landowners to grant you access to their land so you can make those great finds. Everyone in the hobby knows the importance of research to find sites of human activity in the past but few carry out the research. I once asked a group of thirty detectorists why they did not do research and the answer came back; “we don’t know how.” The SEARCH section gives plenty of ideas on places and clues to look for, so you will know how and what to research. Even though I have been in the hobby for over 40 years I was still able to learn from this book. It contains a goldmine of tips, resources and information, not only for beginners but for all metal detectorists and treasure hunters.